For a complete list of services, please visit the Service Schedule and monthly calendars on the parish website. The relatively young history of Holy Apostles Mission is one filled with activity and movement. Our Mission is the daughter parish of Christ the Saviour Orthodox Church in Harrisburg, Pennsylvania, where Archpriest Daniel Ressetar is the pastor. The original plans for Christ the Saviour Orthodox Church, founded in 1963, over forty years ago, included the plan to eventually give birth to a mission—something that should be the intent of every Orthodox Church! 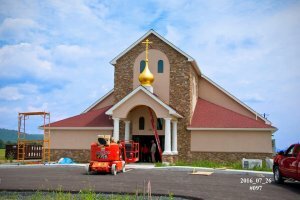 When the time was right and a group was sizable enough to make this endeavor, the “Mechanicsburg Orthodox Mission” (lovingly called “M.O.M.”) was founded on June 20, 2004. Holy Apostles Mission was established on the western shore of the Susquehanna River, choosing Mechanicsburg as the central location to meet the needs of the faithful of the area. Mechanicsburg is a city of roughly 10,000 people and is a surrounding city to more metropolitan areas such as Harrisburg and Lancaster. The need for a parish community closer to a good number of the faithful of this area (some of whom were traveling more than an hour to services at Christ the Saviour) was realized, and in less than a year’s time His Beatitude, Metropolitan HERMAN, then Locum Tenens Bishop of the Diocese of Philadelphia and Eastern Pennsylvania, gave the blessing for the Patronal name “Holy Apostles” to be the heavenly protectors of this young mission community. Within a year the parish was able, with the help of Archpriest Neal Carrigan, to establish a weekend cycle of services in a local United Methodist Mission outreach center called “Mission Central.” The faithful of Holy Apostles arrive on Saturday evenings at 5:00 PM at “Mission Central” after it closes, to set up the Chapel and to have Choir practice, followed by Great Vespers and Confessions. We are permitted to leave our Chapel set up overnight for the celebration of Divine Liturgy Sunday morning, but then have to put it away after our weekly fellowship hour following the Divine Liturgy. It can be a difficult task, but the parishioners yearn for a place to worship with the hopes that one day they will be able to have a building to worship in to call their own, and to welcome others to the faith. This vision literally seems to energize the faithful as they work every week to build and take down an entire worship space. After a year of existence, in June of 2005 the mission welcomed its first full time priest, Fr. Timothy Hojnicki, and his wife Matushka Anastasia. This begins an exciting new chapter in the life the Diocese of Eastern Pennsylvania’s youngest mission.